Berg fashions a Spike Lee-esque prism through which he sheds light on the game, though Berg hasn't so much got game as he got highlight. 117 min. Universal Pictures. Director: Peter Berg. Cast: Billy Bob Thornton, Lucas Black, Garrett Hedlund, Derek Luke, Jay Hernandez. Director Peter Berg has a talent for macho movies. Following his pitch-black comedy of bad manners Very Bad Things and the spring-loaded, kung-fu-grip action of The Rundown, Berg takes the field under the Friday Night Lights of West Texas high-school football, circa 1988. Hewing closely enough to H.G. Bissinger's best-selling non-fiction book to retain the participants' real names, Berg keeps the familiar elements of sports drama thoroughly engrossing. Berg fashions a Spike Lee-esque prism through which he sheds light on the game, though Berg hasn't so much got game as he got highlight. Each dazzling or bone-crunching play looks like a lost reel by NFL Films; Berg's kinetic style propels the action with shaky-cam overkill and sheer force of will. Berg also shows he's capable of restraint. Like Oliver Stone's Any Given Sunday, Friday Night Lights bleeds its players like war-torn freedom fighters, but Berg also quietly places, where he can be briefly glimpsed on the sidelines, a paralyzed ex-player: a spectre of the game's implicit danger to body and soul. The director knows that athletic action is old hat, so he focuses on the personal implications of the game on its players and a community. Though no individual character holds the focus for long, Berg's gambit effectively supports the pro and con theses about team sports--like it or not, there's no "I" in team, not even Billy Bob Thornton as Permian Panthers coach Gary Gaines. Thornton is, not surprisingly, terrific. Some actors do a slow burn; Thornton is the master of the slow melt. Slouching in resignation at each reversal and morally doubtful, Gaines nevertheless plugs onward, ever-ready with an inspirational pep talk and a prayer for salvation from the fickle fates of football. Friday Night Lights reunites Thornton with Lucas Black, who eight years ago played the boy in Thornton's breakthrough film Sling Blade. 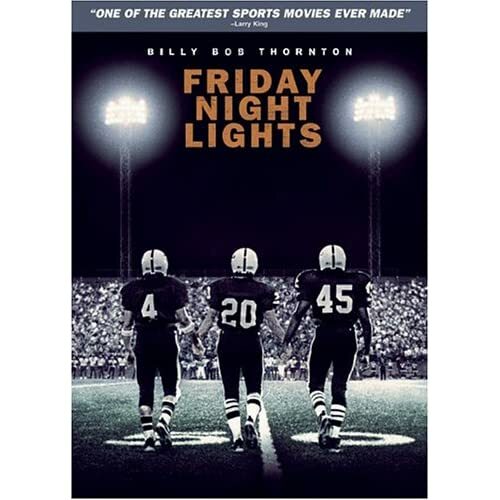 Black (as QB Mike Winchell), Garrett Hedlund (as put-upon tailback Don Billingsley), and Derek Luke (as ill-fated running back Boobie Miles) head up a strong ensemble which also includes first-time-actor and longtime country artist Tim McGraw as Billingsley's abusive father. Luke ought to get some kind of award for playing this role and the tenacious young agent of David Mamet's Spartan in the same year. Berg, who is Bissinger's cousin, and co-screenwriter David Aaron Cohen get to some essential truths about competitive sports, and rightly conclude that the game is everything and nothing. Game play offers an adrenaline high, and winning assures back-scratching affection from town leaders, teachers, and willing young ladies. The game likewise promises Hobson's choices and personal defeats, foreshadowed by the constant pressures thrown on players and coaches: town lawmen routinely roll up, smile, and ask the men if they're going to win. Jay Hernandez's tight end bemoans, "We've gotta lighten up. We're seventeen," and Billingsley counters, "Do you feel seventeen?" Inevitably, every football player—champion or no—will be shown the door of his stadium and face an unknown (but certainly unsatisfying) future. Friday Night Lights fudges the team's season-ending game a bit, but Berg admirably leaves his graduating seniors (and us) with the maddening question of high-stakes sporting: is it better to have played and lost than never to have played at all? 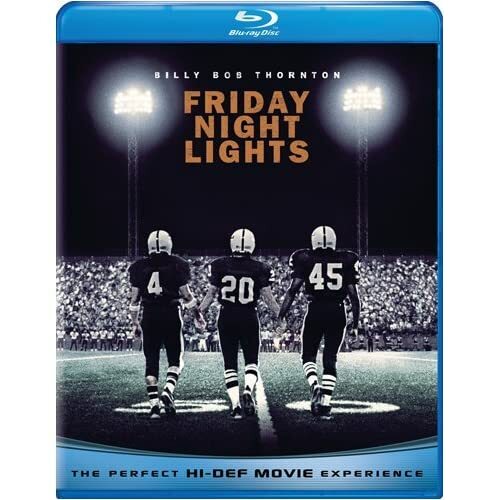 Universal does right by the popular catalog title Friday Night Lights in its Blu-ray debut. An outstanding transfer offers exceptional detail without sacrificing a film-like look. I can't imagine better results for this title: detail is great, and colors are true to the source material. The bone-crunching action packs a wallop in DTS-HD Master Audio 5.1 that will do better than put you back into the theater: it puts you back on the field. First and foremost in the bonus features is an entertaining commentary with two gregarious cousins: writer-director Peter Berg and author H.G. Bissinger. Berg is actually somewhat laconic on this track, playing straight man to the enthusiastic Bissinger. They discuss the adaptation of Bissinger's non-fiction book, lots of details from the real Odessa, Texas, and the film's critical reception by film writers and Texans. "Action-Packed Deleted Scenes" (21:48, SD) mostly offer extended sequences, including extended pep talks by Gaines. All of the trims are interesting and some are humorous, like the added bits of Gaines enduring the school's advice. Added character moments (as with Winchell, Billingsley and Chavez) particularly make these scenes essential bonus features, which makes "Action-Packed" an odd appellation. "Peter Berg Discusses a Scene in the Movie" (1:09, SD) has the director, from the set of a Friday Night Lights reshoot, introducing the scene that was added to the film. "Ryan's Player Cam" (4:19, SD) is a very cool, candid video diary from Ryan Jacobs, one of the football-playing extras. In "Tim McGraw: Off the Stage" (6:11, SD), McGraw, Berg, producer Brian Grazer, Garrett Hedlund, Billy Bob Thornton, and Lucas Black discuss McGraw's acting debut. "Friday Night Lights: The Story of the 1988 Permian Panthers" (23:32, SD) includes local news footage from 1988 and interviews with the real-life principals on that year's team. Interviewees include Berg, Grazer, Bissinger, "Boobie" Miles, Don Billingley, Mike Winchell, Brian Chavez, Derek Luke, Garrett Hedlund, Lucas Black, Tim McGraw, Billy Bob Thornton, Odessa American feature columnist Ken Broadnax, Permian Panthers trainer Tim "Trapper" O'Connell, and 1988 Permian cheerleader Marca Washburn, among others. "Gridiron Grads" (14:11, SD) documents the work of 2nd unit director Allan Graf: whittling 285 auditioners to a 40-man squad of football players over three days of tryouts, the film's training camp, and the shoot. We also get to see Berg addressing the squad. Last but far from least is "Behind the Lights" (26:51, SD) a nicely done, legitimate making-of doc, with Berg, Grazer, Bissinger, Luke, Washburn, Thornton, Black, McGraw, Graf, Lee Jackson, Hedlund, Jay Hernandez, Miles, and Chavez. Universal also enables the disc with BD Live, for bonus content and the ability to share My Scenes. Without doubt, this is the version of the film to own on home video. All site content © 2000-2019 Peter Canavese. Page generated at 04/21/2019 01:40:03AM.